If you’re a fan of fruit candy vapes, you should definitely check out this deal at US vendor Eight Vape. 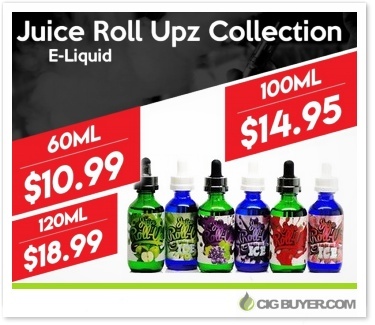 They have their entire selection of Juice Roll Upz e-liquid reduced by 40%! If you haven’t heard of Juice Roll Upz before, as the name suggests they specialize in “fruit roll-up” inspired flavors. Just like the lunch snacks from your childhood, Juice Roll Upz comes in a variety of fruity flavors, including: Apple, Blue Raspberry, Grape, Strawberry and Watermelon. They also have a few “iced” menthol versions available, along with several other candy flavors in the Carnival Juice Roll Upz collection. * Expiration of this Juice Roll Upz deal is unknown. Good while supplies last.